How could the royal families and the military keep their secrets in the past and how can e-mails and bank accounts be protected from hacking today? 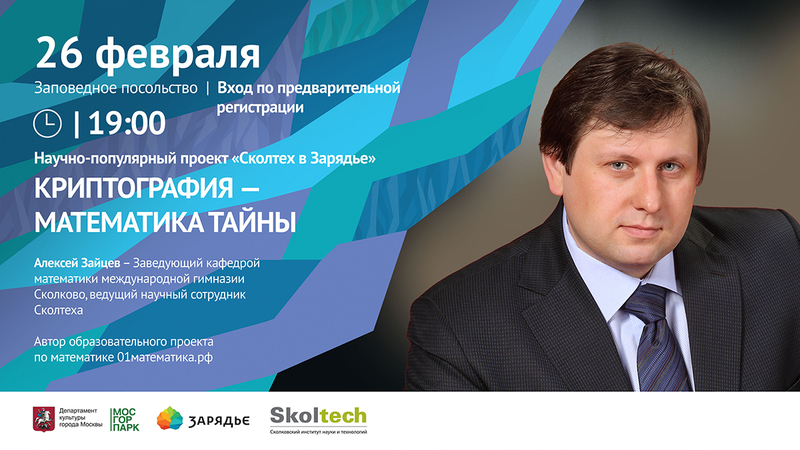 Join the lecture by the Head of the Mathematics Department at the Skolkovo International Gymnasium and Skoltech Leading Researcher, Alexey Zaytsev, to find out more about cryptography – the mathematical engine for safeguarding sensitive information, and to learn how the world’s intellectual giants changed the course of human history by trying to break one another’s codes. The lecturer will discuss the mathematics of the digital world and speculate about how a real quantum computer might tip the balance of power in the cryptography battleground. The lecture will be given in Russian at Zaryadye Park Lecture Center on February 26, 2019 at 7 p.m.
Head of the Mathematics Department at the Skolkovo International Gymnasium, Leading Researcher at Skoltech and the author of the 01математика.рф educational math project. Research focus: algebraic geometry (inclining toward functional fields and algebraic curves over finite fields), abelian varieties over finite fields, elliptic curves, number theory, coding theory and cryptography, group schemes, deformation theory of abelian varieties, and the zeta-function of the tower of functional fields.